(Washington, DC, November 29, 2017) – The Venezuelan government has systematically used brutal treatment, including torture, against anti-government protesters and political opponents, Human Rights Watch and the Penal Forum, a Venezuelan rights group, said in a report released today. The 62-page report, "Crackdown on Dissent: Brutality, Torture, and Political Persecution in Venezuela," documents 88 cases involving at least 314 people, many of whom described being subjected to serious human rights violations in Caracas and 13 states between April and September 2017. 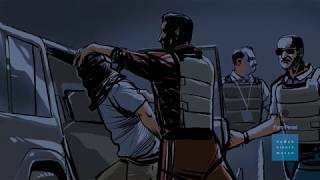 Security force personnel beat detainees severely and tortured them with electric shocks, asphyxiation, sexual assault, and other brutal techniques. Security forces also used disproportionate force and carried out violent abuses against people in the streets, and arbitrarily arrested and prosecuted government opponents. While it was not the first crackdown on dissent under Maduro, the scope and severity of the repression in 2017 reached levels unseen in Venezuela in recent memory.